All the insects that visit your garden require food, and honey bees, solitary bees, butterflies, some beetles, bumblebees and hoverflies as well as many other insect species, use nectar and pollen as a food source. Many traditional cottage garden plants have supplies of nectar and pollen, but it is not always easy to obtain these old fashioned plants - sometimes the best place to find them is in the garden of a friend or neighbour. Garden Centres often concentrate on the latest introductions, with bigger and showier flowers, and these are just the kinds of plants that often have little or no nectar, or you may find 'wildlife-friendly' plants wrongly labelled as such. Harmful insecticides may also have been used on some Garden Centre plants. Good nectar plants can be incorporated into many different situations in your garden, especially if you have existing borders, and some are suitable for containers. However you may want to look at a border specifically for pollinators and a ‘nectar border’ is a brilliant way of helping a large range of invertebrates. Also, a special nectar border is a way of encouraging wildlife in a quite unobtrusive way, as by choosing the plants that pollinators like, you can encourage them to visit the garden without including habitats such as wildflower meadows which can take up a lot of space. So a special border may be particularly valuable in a smaller garden, or one where a more conventional look is required. It is possible to create a cottage garden feel, where every plant is a good nectar or pollen source. If you wish you can also include plants with seeds to encourage birds. Your visiting pollinators will also bring in bird species such as warblers, robins, wrens and spotted flycatchers, as well as hedgehogs and other small mammals. Most wildlife gardening books have lists of good nectar plants, but one of the best ways of choosing plants is to use your own eyes when you are visiting friends' gardens or gardens open to the public, and make to a note of anything you see that seems to be attracting insects. Even a visit to a Garden Centre can provide useful information if you look at the plants that insects are visiting. It is though worth remembering that nectar production is dependant on the time of year, the weather, and even the type of soil. A plant that may be brilliant in a garden you visit may not be that great with you, so there is an element of trial and error. 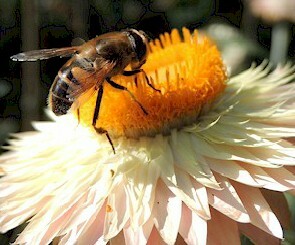 However there some plants that are guaranteed to bring butterflies, bumblebees, honeybees and hoverflies to your garden. If I had to choose my top 10 nectar plants for pollinators from my own garden borders, that list would include buddleia, lavender, scabious, globe thistle, catmint, borage and verbena, plus the wildflowers vipers bugloss, marjoram and purple loosestrife. There are many other good plants for pollinators but remember that a mix of natives and non natives will really get your borders buzzing. The links below will help you to find plants that will encourage many different types of pollinator. * Getting to Know your Beneficial Insects * What is 'The June Gap'?